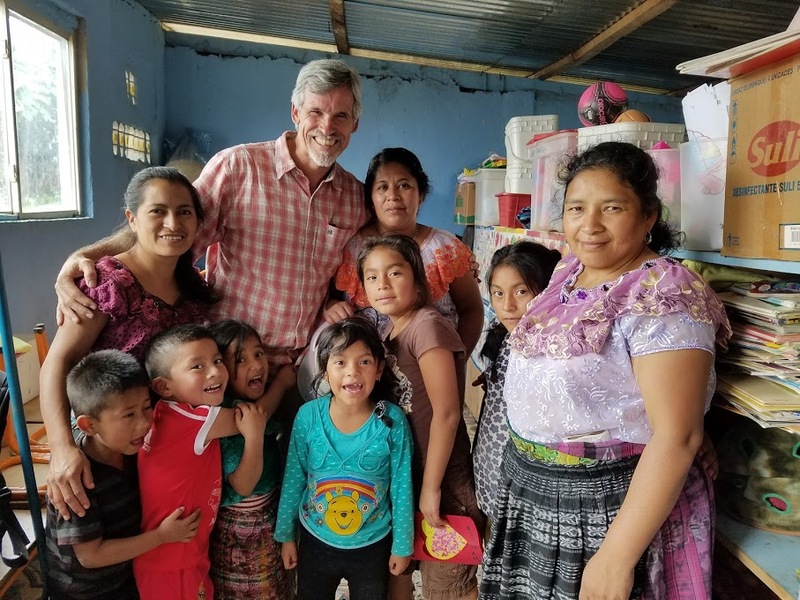 A group of 20 of us from California traveled to Guatemala at the end of June 2017 to spend a week in Panyebar. Our group was half adults and half youth and kids. While our main goal was to cultivate our relationships with the Colegio Bethel students and staff, we also spent time working on projects at the school, community library and preschool. See more pictures from our trip. At the school we repainted the basketball court lines and replaced the old rims and nets. We led a basketball camp and played a lot of informal basketball and soccer games. At the library, we got to help with the “Aulas Magicas,” a program for kids. At the preschool, we helped with crafts and we passed out new toothbrushes to the kids. The preschool teachers and some parents delivered to us 125 beautiful handmade ornaments for us to sell back at home. All the profits will go back to the community. Our team included two medical professionals and they visited many shut-ins and sick people who needed care. In addition, several of us met with a local pastor to explore his vision for opening a Compassion center. We were received warmly by everyone in Panyebar and were impressed to see gifted leaders at the school and in the community. It is exciting to see how many of the students who graduated from the school are now attending college or working in various professions. One very sad event took place after we left. In October, one of the beloved preschool teachers died suddenly of a stroke. We are trying to find ways to support her family. She left behind nine children ranging in age from 2 to 22. First, bad news: A recent earthquake has rendered Colegio Bethel's founding church in San Pedro la Laguna unusable, and civil engineers confirm initial reports that the building will have to be razed and rebuilt. This is an unexpected and devastating blow for the church and the long-term solution to this event will take time to unfold. A little helpful news: The top floor of the school is finished, and can be rented to the congregation for its services until they have a new building or find other accommodations in San Pedro. This will provide a little extra income for the school and make it possible for the church to continue services uninterrupted. Bruce reports that the school's staff and students are extremely grateful for the support they receive and that they are doing well. Upcoming events: In September, several supporting families will be hosting informational events to share the video and their own experiences in Panyebar within their communities. These events will be held in a number of cities and hopefully will expand our extended family of supporters and enable Colegio Bethel Panyebar to continue to build future leaders of Guatemala.